First off, I am sorry for not covering this topic earlier. As a wedding blogger, seeing brides and bridal wear day in and day out is part of the job. But what I realized as part of my research on plus size bride is that it’s quite rare to find images of real plus size brides. Weddings come with a lot of pressure to look good be it whoever, even miss world for that matter. Everything is scrutinized to the t and for someone who is not so comfortable in their own skin, this can quickly turn out to be a nightmare. I remember one day when I was wedding shopping, the store guy showed me a ton of designs that would ‘fit’ me, but for another (plus size) bride, he took out probably 3 designs and said, “isko chod ke hamare paas aur kuch nahi hai“. I could only imagine what that bride would be going through. P.S. Not all brides on this post are plus sized, I have simply taken them for reference for the outfits they have worn. I am not sure if you remember this Sabyasachi wedding lehenga. It’s very similar to the one that International Fashion Blogger Diipa Khosla wore to her Udaipur Wedding. Not making any comparisons, but wait, I think I will. This bride looked absolutely sensational in this heavy velvet bridal lehenga. Usually, you would hear from people, family and store guys to stick to lighter looking fabrics. But Sabyasachi showed us it’s not the fabric but how you drape it that makes all the difference. The embroidery on the lehenga skirt is much less than usual bringing the eyes back on the bride. Even the motifs are not too bulky. I am not sure if I make sense. But you understand right? It’s not too loud and in your face kinds. I came across this beautiful brides WordPress blog while researching on outfits for plus sized women. I absolutely loved all her outfits in her wedding trousseau. She has done such a brilliant job in looking fantastic in all her wedding functions. Especially, in this picture above, notice how the dupatta border in front almost takes your eyes off the whole body frame and cuts it into half! It’s genius, and you can try this too. Bonus points for choosing a colour and design that’s pleasing to the eye with the small bootis and a slim dupatta border which is a big win win. # Light Shade Outfits/Lehengas are in trend and perfect for you ! Pastel shades are ruling the wedding fashion scene for quite some time now. They look great on every body type. Whether you are slim and trim or curvy, beige, pista shade, pinks, and corals will never go wrong. Now, this bride is not really plus-plus sized, I agree, but the lehenga has managed to slim her down beautifully. The eyes go on her delicate buttis work and dupatta, and overall looks stunning for a day wedding. # Dupatta is a Girl’s Best Friend ! A dupatta is probably the most important garment in any ethnic wear outfit. Every girl likes to show it off, and it’s one of the best pieces to make use of to hide any unwanted flaws. Even slimmer women use it to hide their tummy fat or waist list flaws. It’s the perfect trick in the book to use. Vertical designs automatically add height to any outfit. Go with lehengas which have slimmer vertical designs on the top and gradually bigger thicker vertical designs on the bottom. Just like the outfit pictured above. # A double dupatta can be an awesome camouflage idea! Why should slim women have all the fun? I shared this bubbly happy picture of this bride just to let you know that nothing no one should stop you from feeling beautiful on your wedding day. With a two dupatta look, just make sure that at least one of the dupattas is light sheer colour so that it doesn’t attract too much attention and yet does the job. 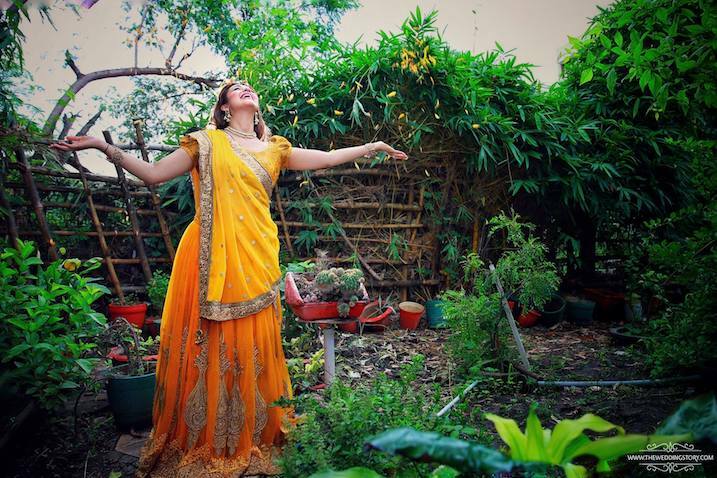 Love how carefree badass this bride looks while twirling in her perfect lehenga. # Opt for Flowy Fabrics instead of Silk ! Silk naturally has a stiff fall which slim women use in order to look more curvaceous. For plus size bride, there are a hell lot of options in fabrics. From georgette to chiffon, anything that has a flowyness to it, it would slim you down to a great extent. It’s comfortable and you won’t need to worry about anything extra showing. You can opt for a tighter at the waise blouse which goes just above the lehenga skirt. It does the job. Just make sure you don’t opt for a heavier border on the bottom. You don’t want to attract too much attention there. The good part about this tip is you can opt for any colour lehenga skirt to go with your top. The eyes directly go to the bottom and take away from anything that’s going on the top. Do you have any other tips to share with fellow brides?